Following the trends of last year—when she presented a series of clothing and furniture made of horse hides—designer Valdís Steinarsdóttir now tackles the issue of waste generated in the meat and plastic industries. 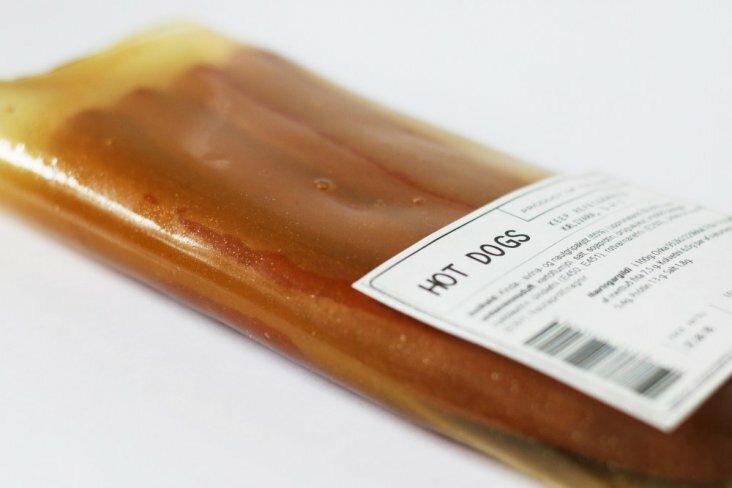 ‘Bioplastic Skin’, her new invention, which will be presented at this year’s DesignMarch, uses animal hides to create a plastic-like material which can then be used to package meat products from the same animal, according to an article by Sam Daniels on Grapevine.is. “The idea started when I was studying at the Icelandic Academy Of The Arts in the product design department,” explains the designer. While there, Valdís began to look at the amount of waste produced by the consumption of horses. See, when we get meat from animals, there are a number of less desirable byproducts that go unused or even discarded. Valdís took these byproducts, began to experiment with them, and discovered that there were quite a number of applications that could be derived from the material. “I thought it was kind of poetic. I thought meat wrapping would suit it,” Valdís explains, as she talks about the haunting prose of her project. That is, of course, the idea of putting an animal back into its own skin in order for it to be eaten. To her, this process is incredibly natural, but from an outside perspective, it might appear to be rather strange. But because of that, Bioplastic Skin forces you to question your own personal beliefs and morals regarding the meat industry. It’s a project that provokes a reaction, and that reaction itself is what teaches you. There is a strong educational value to this, as it shines a light on the wasteful nature of our society. The process of making the biodegradable packaging involves boiling the hides to collect the collagen, a structural protein. “For many centuries, we have been making wood glue with this method,” Valdís explains. She took this process and tweaked it in order to create the plastic-like material. Nowadays, she is even able to use variations of her recipe to create hard and soft plastics to suit the needs of the product it would be used in. “This is just one possibility of so many with biodegradable plastic,” Valdís concludes confidently. She strongly believes that Bioplastic Skin, as well as biodegradable plastics in general, have a strong future. While she is currently unsure whether she will take this project further, she’s confident that it has the potential to inspire others. Her passion and enthusiasm, though, shines through in all she does. And while a passion for animal waste might seem bizarre to others, it just might be the solution the world has been looking for.